The electrical job briefing is a chance for workers to stop and think before starting any electrical job. 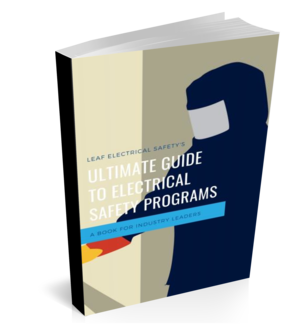 Whether you are in oil & gas, pulp & paper, mining or manufacturing automotive parts, electrical work is inherently dangerous and should always be treated with respect. After reviewing hundreds of incident reports it is clear to me that adding a few extra steps into the beginning of the work routine will greatly reduce the number pf injuries and fatalities caused from arc flash or shock. These extra steps are part of what’s called a job briefing and by following the practices outlined in this article it will help you to create a safer work environment for all. The following depiction shows the overall thought process and flow of an electrical job and subsequent job briefing. The goal is that the job briefing aligns the workers and acts as a reminder to discuss all parts of the job. Use a blank sheet of paper, the back of a napkin or your smartphone… what you right the job briefing down on doesn’t matter as much as the thought that you put into it. What’s important when preparing for the job? List any workers who will be associated with the job. Write the time and date (Ii the job takes longer than one day you’ll need to start another job briefing upon your return… things could have changed). List all the associated field equipment for the job. This step is absolutely critical. To many job procedures and pre-job plans focus on the overall task rather than the activities it takes to get it done. An example would be “changing a motor”… that might be what you are doing today, but to make sure you’ve thought through all the steps and times you might be at risk you should be writing down and discussing things like “disconnect the motor”, “testing for absence of voltage” and “start up commissioning tests”. What tasks include a human error factor? Will you be testing and/or troubleshooting? Will you be establishing an electrically safe work condition? Will you be exposed to energized equipment? It’s time like these when people get hurt or equipment is damaged. Depends on where you work as some places have fantastic records and others have no records at all. Gather the resources that you can that will help perform the task in an efficient and safe manner. The arc flash and shock hazard warning label will have all the necessary information. If no label is present, use alternative methods discussed in CSAZ462 or NFPA70E (i.e. arc flash PPE category method). Does a shock hazard exist for this task/job? Follow this flow-chart and if it is determined that a shock hazard exists the use of rubber insulated PPE is required to complete that particular task/job. Does an arc flash hazard exist? 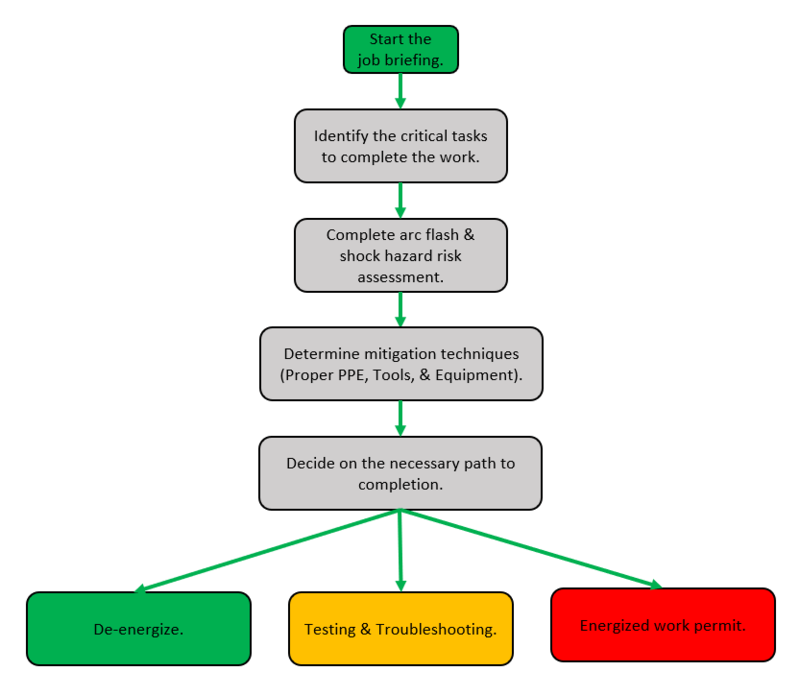 Follow this flow-chart and if it is determined that an arc flash hazard exists the use of arc flash PPE is required to complete that particular task/job. Another thing you’ll need to determine is what tasks have a higher risk of causing an arc flash. What is a normal operating condition? There are some tasks you might think could cause an are flash but are really considered a normal operation of the equipment… so if done properly, those tasks have an inherently low risk of arc flash. there is no evidence of impending failure such as arcing, overheating, loose or bound equipment parts, visible damage, or deterioration (use your senses; look, listen, touch, smell). How does normal operating condition impact arc flash? Regardless of the task, if equipment is not functioning under normal operating conditions (abnormal condition) then it should be treated as an arc flash hazard (as long as the equipment is rated 240 volts and above). If an arc flash or shock hazard exists (see above flow charts), PPE will be selected based on the incident energy and voltage levels respectively. Barricades (or stand by attendants) will be placed at either the limited approach boundary or the arc flash boundary, whichever is greatest. Now it’s time to get the job done! This all might seem like a lot, but once you get into the flow of things you can complete a job briefing very quickly. Adding an electrical job briefing to your electrical safety arsenal might just be the best thing you do all year to improve your safety standards. If you enjoyed this article please “share it” or “like it” with the links below. It’s the best way to spread the word.